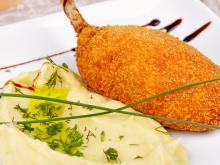 "The beloved French classic - now at your table too." Cut the eggplants into round slices and sprinkle with salt. Leave them to sit for 20 min. 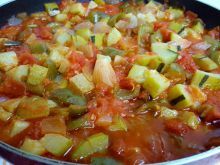 Wash the other veggies and cut into round slices - the zucchini, tomatoes, onions and peppers. Wash the eggplants and drain away the bitter juice. Season the veggies with salt and black pepper. In a tray smeared with olive oil, start arranging the veggies from the outer edges in a spiral inward. 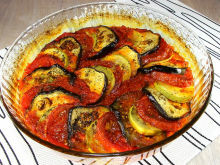 Arrange a slice of zucchini, onion, tomatoes, eggplant and pepper. If you've got a whole lot of veggies, arrange them upright, if you've got less - arrange them leaning. Sprinkle with thyme and olive oil. Bake at 374°F (190 °C) for 40 min.